I’ve been bursting to share this news for months now, but since I didn’t buy my plane tickets until a few weeks ago I didn’t want to tempt the Fates and jinx anything. Now that all of us are officially squared away, though, I’m super stoked to tell that for about five weeks after graduation, I’m going to Spain, the UK, the Netherlands, and some place TBA (but equally exciting)! You might remember that I spent three weeks last August traveling around Europe, staying with friends and visiting local sites in the UK, Ireland, and Italy. We hit a few snags along the way, but mostly I had an amazing time and couldn’t stop raving about it for months afterward (no more than I could stop making travel-inspired recipes!). This time, at the top of my bucket list will be the Harry Potter Leavesdon Studios, the Writers Corner at Westminster Abbey (where Chaucer, Kipling, Irving, Hardy, and others are buried), Stonehenge, a trip around the Scottish Highlands, and “les chauteaux en Espagne” that they commemorate in this song from one of my favorite French films, Les Choristes. In the meantime, I have been controlling myself just barely by making celebratory treats from some of the places I’m going to visit! 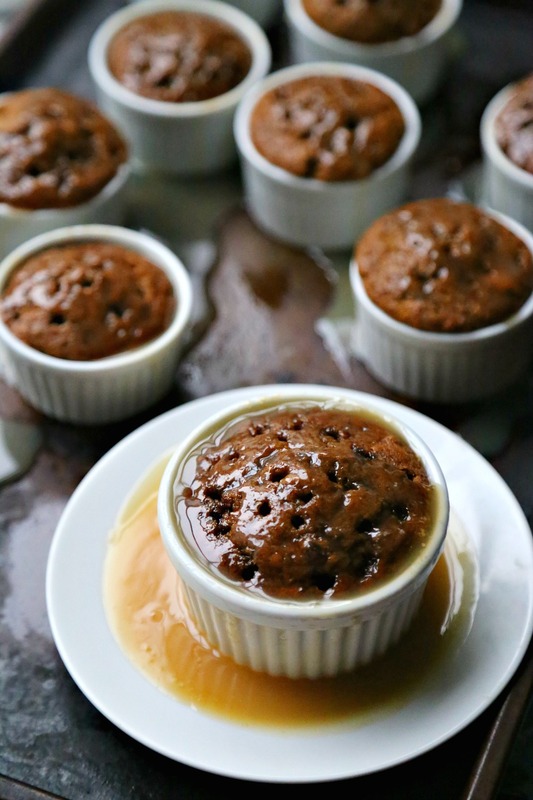 First up is this English Sticky Toffee Pudding, a class British dessert featuring a warm, treacle-infused cake with a decadent toffee sauce poured all over it. I had only ever tried this dessert at Universal Studio’s Harry Potter land when we visited last year, but we immediately fell in love and I just knew that I had to recreate it at home. Lo and behold, I finally have and oh my god, GUYS. IT IS SO GOOD. Seriously, like I don’t even understand why Brits even complain about the weather when those overcast northern climes clearly gave birth to this spicy, soul-warming nectar of divinity. Okay, actually I do understand why (I’m currently wearing four layers and a scarf in my 58-degree LA home–I felt like a giant frozen popsicle on wheels yesterday morning when I raced my first ever sprint triathlon in the rain!). 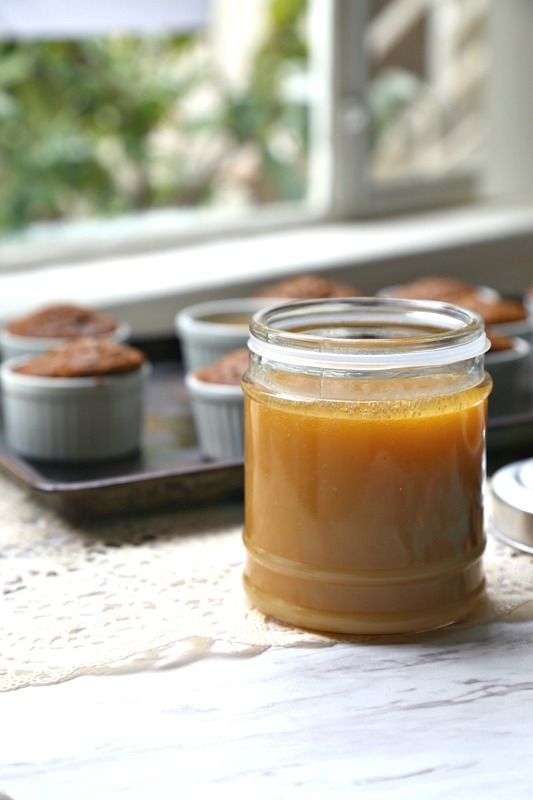 But if I had this decadent, caramel-like sauce to eat with a spoon at all times, I feel like even I could stand the overcast weather in the UK. Buuuut thankfully, we don’t have to put that theory to the test anytime soon because I get to visit Europe in the relatively balmy summertime and, meanwhile, sit here enjoying my sticky toffee pudding in the cozy warmth of California. Win-win! Just make sure you all do yourselves a favor and try this ASAP, k? Any travel recommendations for the UK, Spain, Netherlands, or anywhere else in Europe? I've only ever tried the (bomb!) English sticky toffee pudding at Universal Studios, but we fell so deeply in love with this traditional English dessert that I just had to recreate it at home. This recipe is EVEN BETTER. 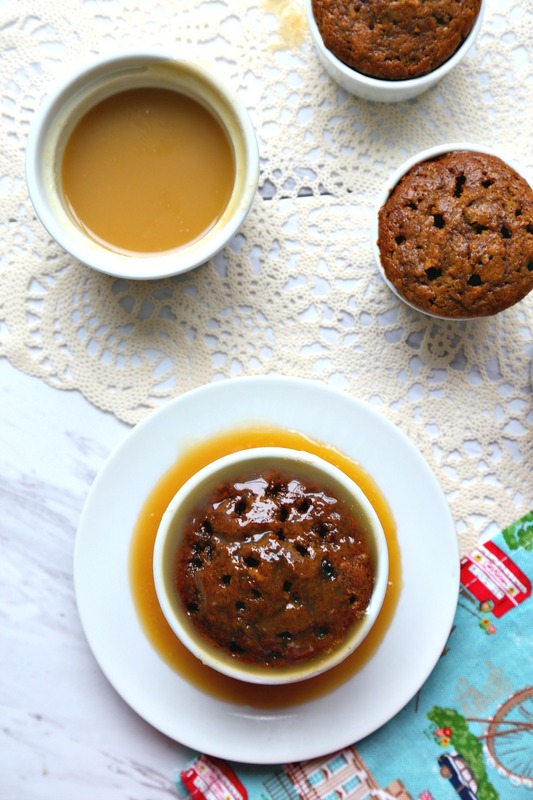 The hot, spice-filled cake is the perfect foil for a sticky toffee sauce that you'll want to eat with a spoon! Recipe slightly adapted from BBC Good Food. Place dates in a food process and chop until quite fine. Place them in a bowl and pour boiling water over them, submerging them completely. Let soak for 30 minutes, then mash with a fork. Stir in vanilla extract. Preheat oven to 350 degrees F / 180 degrees C. Oil 10-12 miniature ramekins (I used 2-inch ramekins) and place on a baking sheet. While dates are soaking, place flour, baking powder, and baking soda in a medium bowl, then set aside. In a large bowl, beat together butter and sugar until light and fluffy. Add the eggs one at a time, beating well after each addition, then mix in treacle/molasses. Gently fold in 1/3 of the flour mixture with a spatula, then fold in half of the milk, incorporating as well as possible without overbeating. Repeat until remaining flour and milk is used. Stir in mashed dates. put the sugar and butter for the sauce in a medium saucepan with half the cream. Bring to the boil over a medium heat, until sugar has dissolved. Stir in treacle/molasses, then allow mixture to bubble for 2-3 minutes until it achieves a rich golden toffee color, making sure to stir as needed to prevent sauce from burning. Remove pan from heat and beat in remaining cream. 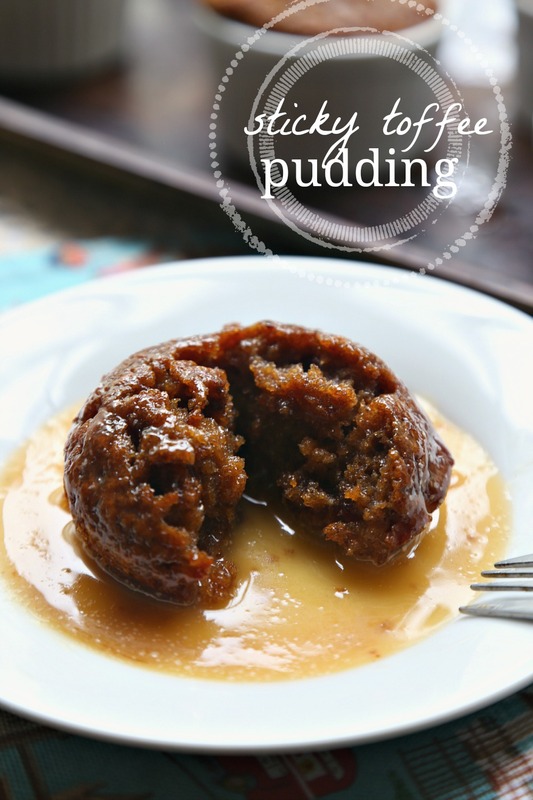 I have always wanted to try English sticky pudding… now I have no more excuses. It looks so rich and delish that made my mouth water. Ok, ok send me a tub of that toffee sauce so I can help you celebrate your upcoming trip! Fabulous dessert Ala! Cool beans! Sounds like a great trip you have planned. Lucky you! And lucky us, if we make this toffee. Looks really great — thanks. I totally want to try this!!! 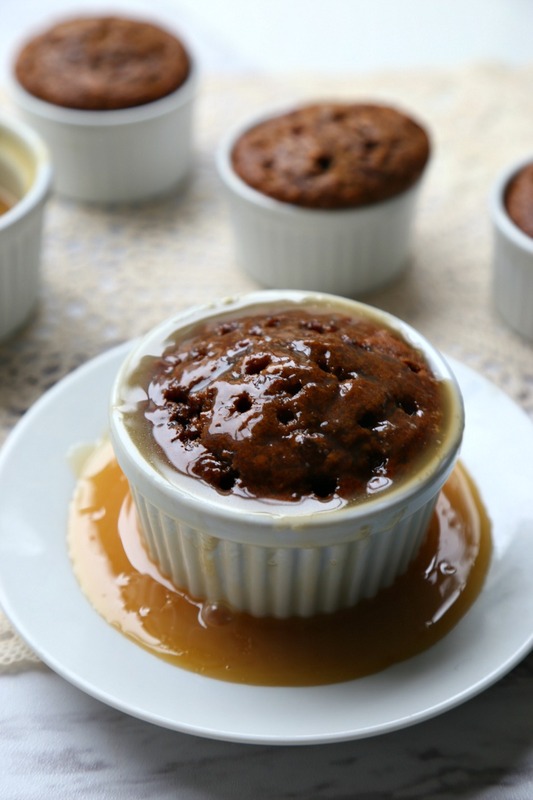 I love sticky toffee pudding! Ah, you would LOVE it, Chelsea! Absolutely do! #1: Take me with you. I do a lot of yoga, I can fit myself in your suitcase. #2 sticky toffee pudding. It’s like crack in a cup. In a good way. 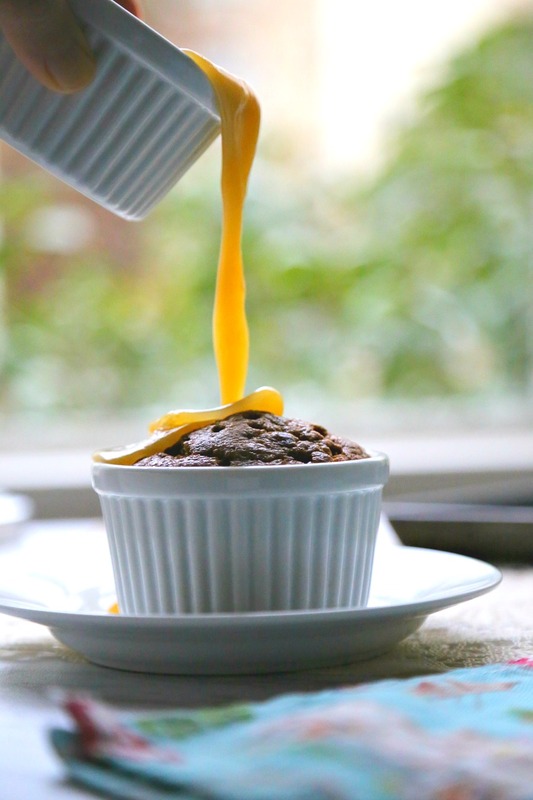 As to what these pictures are all about – Oh my word – this treacle-infused pudding!!! Ala, I hate to be so uncouth but I could seriously guzzle that decadent toffee sauce straight from the jar! This is one heck of a celebratory treat – which brings me to say CONGRATS!!!! I will be visiting London and Italy this summer and need to take a gander over to your posts from your last visit to get pointers myself – while I’ve been to London many times, it’ll be my first time to Italy! hehe you guys have beautiful weather, too! I’m glad, because I was starting to feel like the silly one–I hopped on a call with my NY coworkers this week and they were all wearing short sleeves…And THANK YOU, cannot wait for this trip! Please let me know if you have any good London tips as well, we’re always looking for more to do 🙂 you’ll LOVE Italy, lmk if you need any tips for the Putignano area in the south! 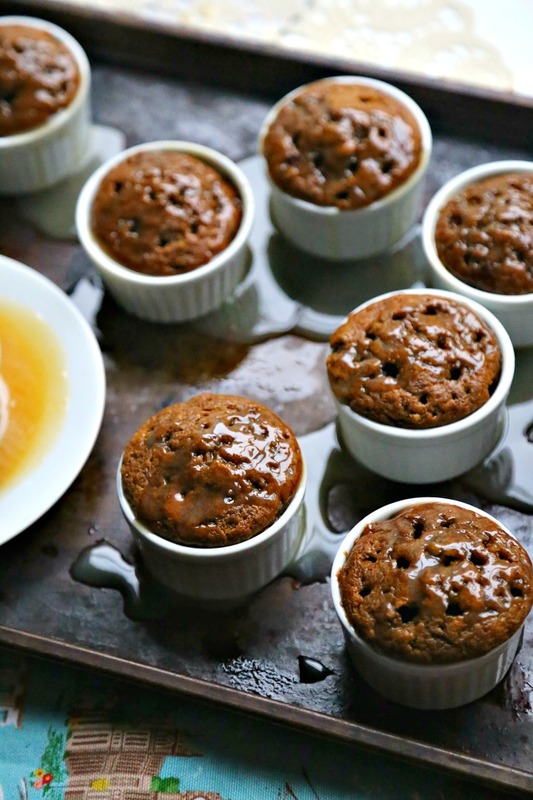 Your sticky pudding looks wonderful, gorgeous pics. Your trip sounds amazing, well done! Sticky toffee is my FAVORITE!! I grew up on it in my bristish colonized country 🙂 I can’t wait to try this pudding with all the gooey ness and that pour over!!! To die for. I also can’t wait to hear about all the THINGS you eat and see on your trip. I loved visiting Den Hague in the Netherlands, if you have time and Maastrict is also a very cute little Dutch town (but I was visiting my best friend in law school there) and I loved Rotterdam too. Had some great restaurants which I can’t remember since it was like 4 years ago. ahhhh I ate so much of this pud in English and scottish pubs! I am so excited for you, i recently posted my guide to the warner bros studio tour – it was the most amazing time you will love it. When in the Highlands if you stop at a famous cafe and meet Hamish the Hairy Coo (cow) get a carrot and give his ears a scratch for me, i miss his furry head. Wow! I didn’t know you had a blog Alethia.. I just found this on my quest for distraction from studying.. This is so cool! Ala, this is one dreamy dessert! I’ve been dying to make it ever since Bill had a piece and finished it off when we were out one night. I didn’t tell him the dreaded date was one of the ingredients. Your minis look amazing. I left you a note on my post about the lemon cake. The only things I could think of were that you didn’t use a tablespoon of baking powder (it’s a lot!) or that your baking powder wasn’t fresh enough. Also, wanted to make sure you mixed for a full 2 minutes at the end to aerate the batter. If all those were done, I’m mystified, too!!! Liz, thank you so much for your response! Sorry I didn’t respond earlier (it’s been CRAZY here)–I definitely remember putting in the baking powder because I remember looking at the tablespoon and thinking WOW, that’s a lot of baking powder 😉 I also tested it for freshness and it seems to be fine! I thought I’d done proper aerating but I think I’ll try again with a timer. Thanks so much, Liz! <3 It was still delicious and I can't wait to give it another go! You know that “adapted from” means you changed something, right? Just doubling the toffee sauce amounts isn’t an adaptation. This is a total copy of the BBC Good Food recipe. Consider your blog banned from my world……. Hey! Sorry you feel that way, DK–the adaptation element actually came from my substitutions of APF + baking powder and blackstrap molasses (for treacle, which isn’t easily accessible in the U.S.) To your point, I’ve added a new note that this recipe is “slightly adapted,” because I definitely give appropriate credit where it’s due. Have a great day! How many ramekins/servings does this recipe fill? This looks so good! !